This program, for newborns through early toddlers, consists of two components: Private Lessons & the Family Class. ​ SongSchool and Motor-Skills Development lessons are the private lessons for the youngest children. The students receive two 30-minute lessons per week (60 minutes total), because two lessons per week improves muscle learning and memory. They are taught in your choice of two styles: 1) privately for a family, or 2) in a small, private group of friends. The emphasis is on developing musicality and linguistic ability in children, and equipping parents with skills for raising musically-confident children. This early stage is the most crucial time of a child's development, laying the foundation for their speech, rhythm, pitch, and numerical understanding. Parents and their little ones also attend a Family Class, where parents and children interact, sing activity songs together, and engage in other musical learning activities. Practice requirements really don't exist at this age. Parents are simply encouraged to play with their children every day, during feedings, baths, diaper changes, and so on. We will teach you and support you in your efforts to create a warm, loving life for your child, a happy life that is full of music and smiles. This program, for older toddlers and preschoolers, consists of three components: Private Lessons, the Group Class, and the Early-Reading Class. ​ Mommy-&-Me and Daddy-&-Me Lessons are the private lessons for preschoolers. 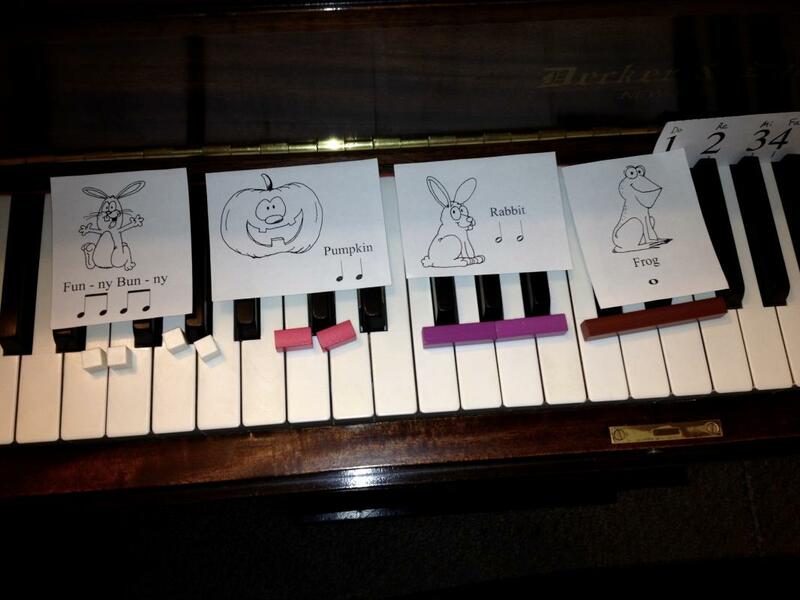 They are a custom blend of student & parent activities, and include both piano and voice. The students receive two 30-minute lessons per week (60 minutes total), because two lessons per week improves muscle learning and memory. Grandparents are welcome as well. Note: Preschool children learn well in groups, so siblings or a few friends of your choice can combine together for one lesson together. Mommy-&-Me and Daddy-&-Me Lessons are the private lessons in our program, so we can accommodate 1-3 students. 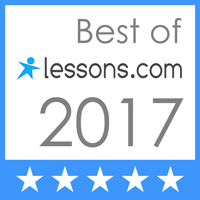 It is important that they maintain the "private lesson" feel. Parents and their preschool children also attend a group event, either the Family Class (described in the Ages 0-2 Program, above) or the older kids' Group Class (described in the Ages 5-Adult Program, below) — the choice of which to attend is up to the parents. The child's age, or the age of siblings coming along, will help the parent decide which class is more suited to the family's needs. The third component of our Ages 2-5 Program is the Early-Reading Class. 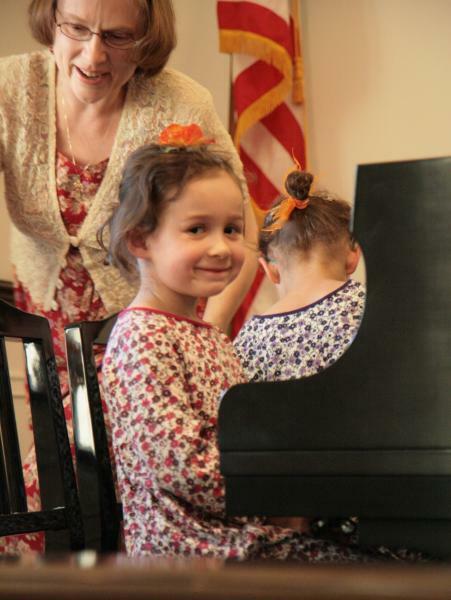 Preschoolers usually are just beginning their skills in reading words, which means they are ready for the early stage of reading music as well. In the Reading Classes for the students in Ages 2-5, we use games and fun activities to work on pattern recognition, numbers and letters, visual tracking of left to right, quick recognition of positions on a set of lines (early reading of the music staff), and other skills that gradually produce secure, confident readers. Young children can learn to read music fluently before they are adept at reading books. Yes, it's true that Mrs. Lichtenstein learned to read music before she could read books! Practice requirements at this age are very small. The most important task for the parent is to develop consistency. 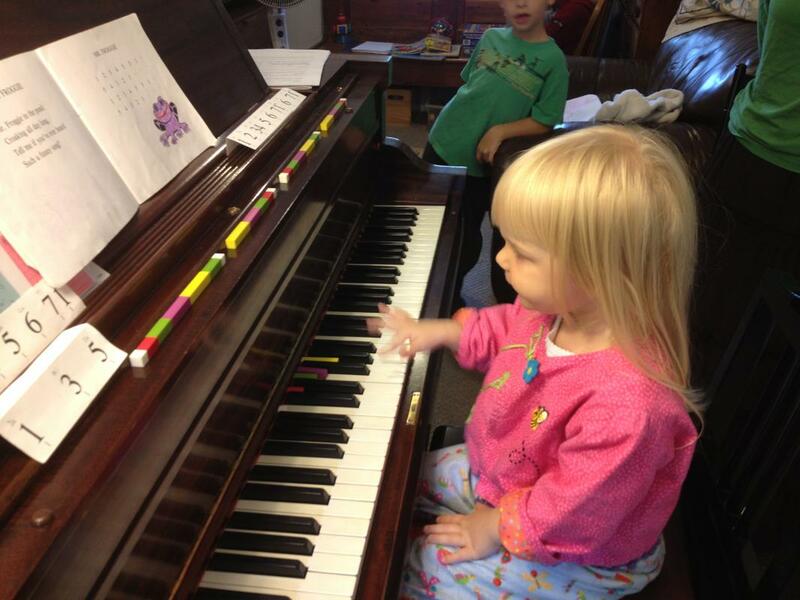 Simply bring your child to the piano or other musical instrument several times a day, for perhaps 2 minutes at a time. Then the child can be left to experiment and enjoy the instrument. It also helps if the parent practices the little songs we learn at this stage — don't worry, Mrs. Lichtenstein will show you how! Toddlers and preschoolers love to imitate Mommy and Daddy. Seeing your interest will make them be interested as well! This program, for mature 5-year-olds through Adults, consists of three components: Private Lessons, the Group Lesson, and the Reading Class. All students attend two Private plus two Group events each week. Our program functions as a school, with the belief that multiple attendance each week encourages healthy social, mental, and physical development in the arts. The burden on parents is reduced, because the biggest problem most school-age music students run into is practicing at home. Practicing at home is still important, and yet our school's program makes the practice easier, clearer, and more joyful. Parents attend the lessons, so they know what needs to be practiced, and can celebrate achievements together with the child. 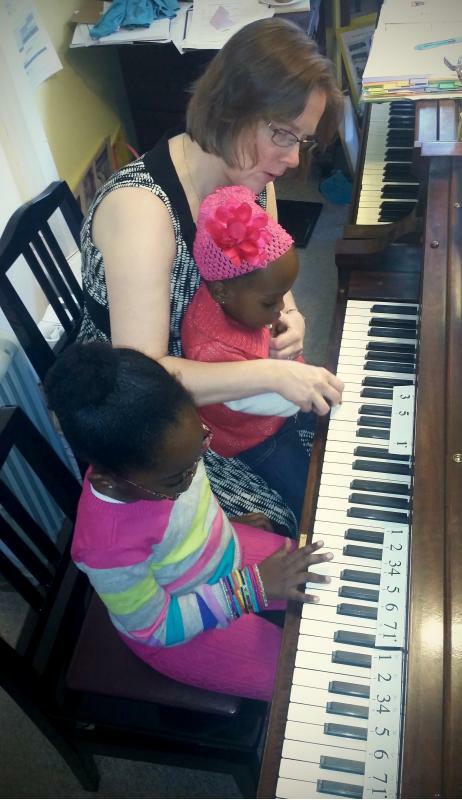 Mrs. Lichtenstein is specially trained in how to encourage the parent-child relationship in musical development. The weekly Group Lesson consists of a celebration of birthdays (including the composer of the week! ), recognition of 7-Day-Practice winners, and an informal recital, followed by musical games and activities. This lesson is called the "Group Lesson," but maybe it should be called "Music Club"! Students love it! The weekly Reading Class consists of games and activities designed to produce secure and confident readers. Being able to read music fluently makes learning new songs as easy as reading a library book! Practice requirements vary by age and ability. It is better to practice a little bit every day, and be consistent, than to try to do too much or wait and do a cram session right before the lesson. Recent science studies also show that it helps to practice a little bit shortly before bedtime, and then to practice a little bit more first thing in the morning. Also, students are motivated to practice, because they want to show their music friends what they learned in their Private Lesson, when they come to the next Group Lesson! New students are accepted any time of the year. The curriculum is adjusted to the individual needs of each student. Therefore, starting any time of year is fine.